The town of Takayama sits in the middle of the Japan Alps, reachable by train via Toyama to the north or Nagoya to the south. We decided to visit (“why not?”) after our stop in Kyoto, as we were slowly making our way east toward Tokyo for our air departure. 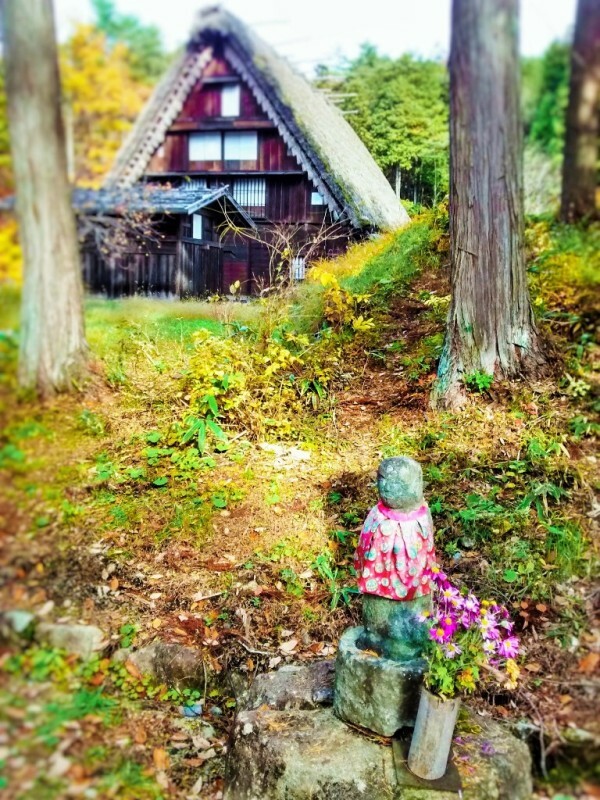 We’d been warned ahead of time by seasoned Japan-travel friends that Takayama is extremely touristy, but we wanted a taste of the Japanese Alps before leaving this beautiful country, and we fancied a hike in the alpine woods as part of our itinerary. That doesn’t really explain why we decided upon Takayama instead of another alpine town, but there we were anyway, headed to this tourist trap via Japan Rail from Kyoto. As soon as we reached the Nagoya station, we switched trains to head north, and the first thing we noticed about our new locomotive was the huge viewing windows in the cars. Up until then, the windows were just your run-of-the-mill (run-of-the-train?) size, and through them we’d been rewarded with some pastoral scenery during our six-hour Tokyo to Onomichi Japan Rail leg. Pleasant enough, but nothing that really blew us away. 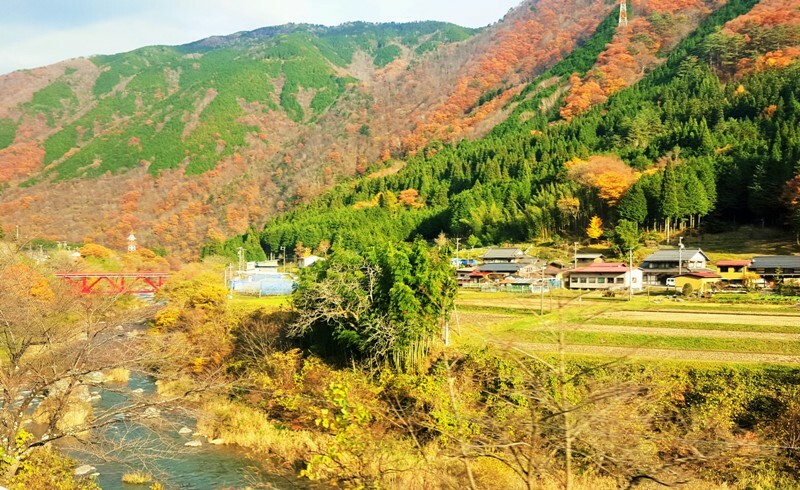 So when our train pulled out from the Nagoya station and chugged its way into the Japan Alps, we were soon grateful for those giant viewing windows, because the scenery was worth the journey alone. Pine and hardwood-covered mountains flanked both sides of us, with rivers cutting between, crowned with red, iron bridges. Lots of red, iron bridges! Little towns clustered along the riversides, the homes a mix of traditional and modern designs, and the neatly plotted squares of farmland created the feeling of seeing a living patchwork quilt. When we reached the town of Takayama later that afternoon, we checked into our digs at the Country Hotel (great location;good price — albeit decidedly un-Japanese sounding! ), which is located right across from the train station. 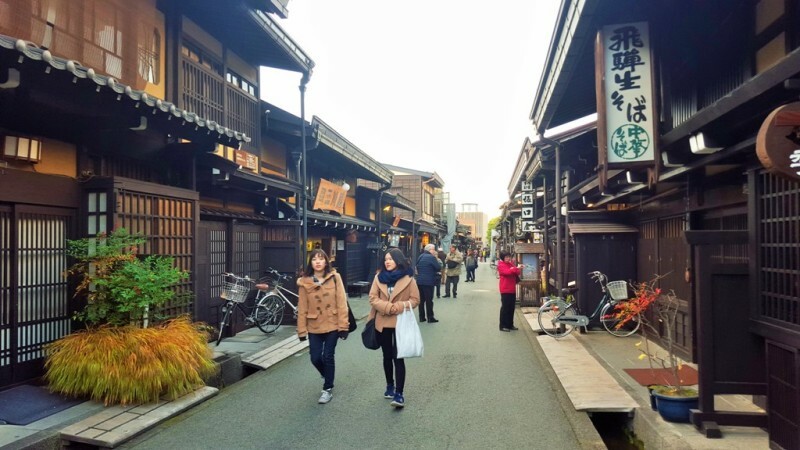 Then we strolled over to the Old Town where wooden heritage homes, sake breweries and curio shops line neatly trimmed, grey streets. The area comprises a few blocks of historical buildings, and more or less has a bit of a Disney village feel to it … except everything is real. Kind of like those cute ski resort towns. 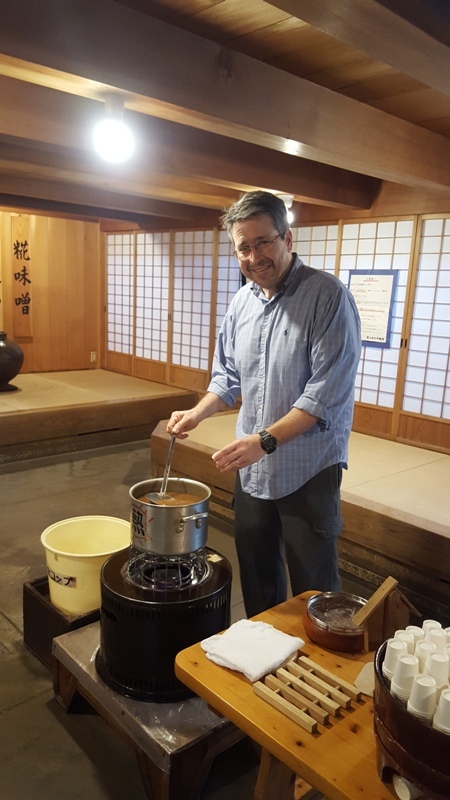 We enjoyed poking around the shops, admiring the architecture dating back to the 1600s, and sampling some miso soup made at one of the local factories. Sake factories offer up samples, too, but we hit the Old Town section a little later than intended, so didn’t have time to do any sake tasting. Even stretching beyond the Old Town area, we were surprised by how walk-able and photogenic (but hilly!) 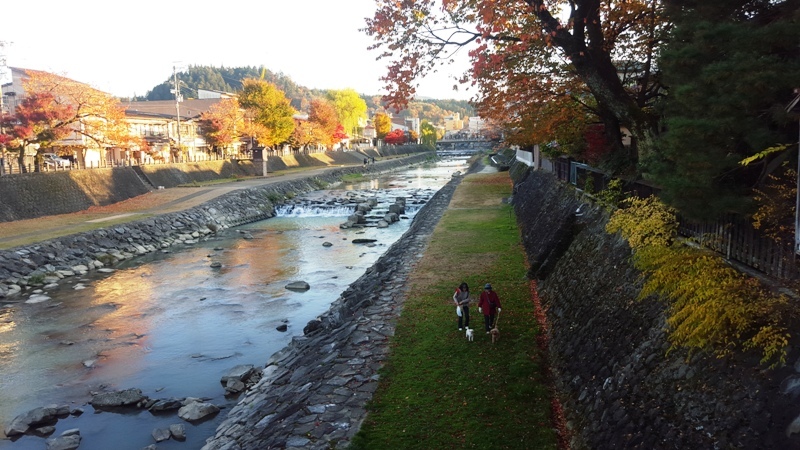 Takayama is with its rivers winding along old streets, temples, shrines, museums and pretty bridges. 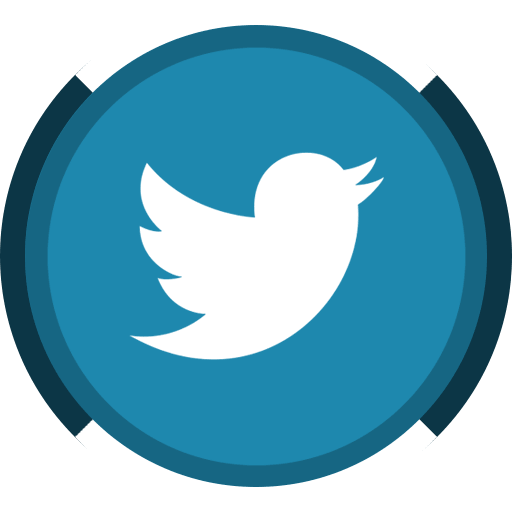 In fact, there are two interesting “town walks” demarcated on the the tourist map. The first goes along the river and then through the museum district before heading into the leafy hills, the entire walk being about three kilometers. We were surprised by the change in landscape for such a short hike … as well as unexpected signs along the way! 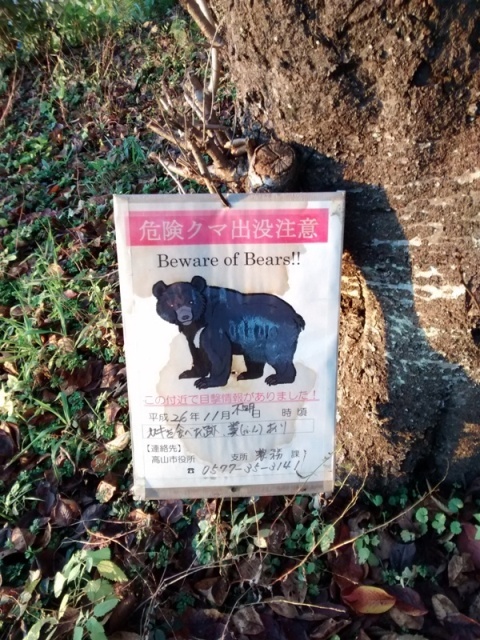 Not exactly what you expect to see during a town walk in Takayama! The second walk, which we didn’t do (but would have if we’d had more time) goes along an impressive collection of temples and shrines before wending into the Shiroyama Park. This one is longer at about five and a half kilometers. 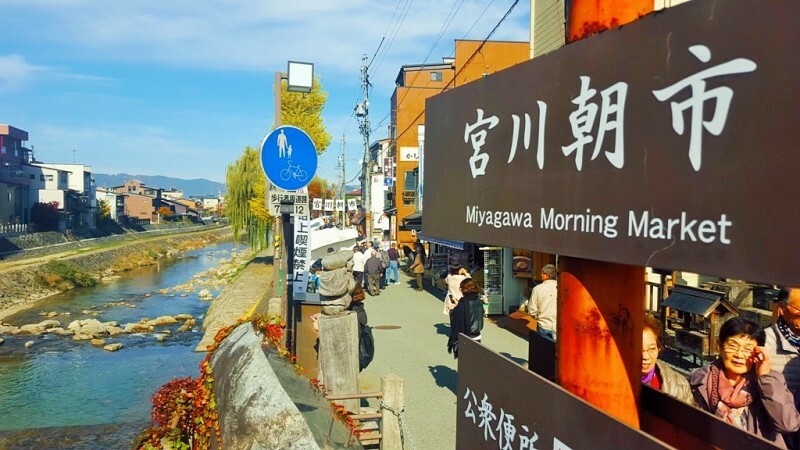 Takayama has two morning markets, both of which are by the Miyagawa River, only a few blocks south of Old Town. 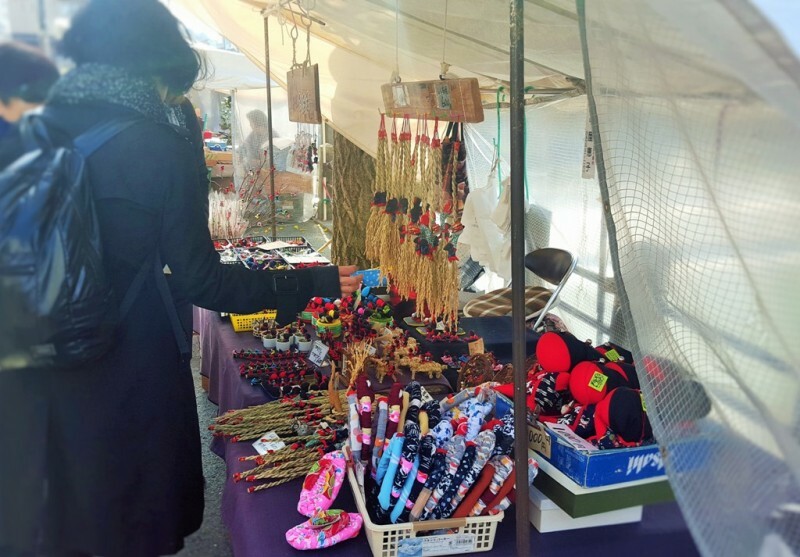 The next morning, we walked to the Miyagawa Morning Market, where white tents parallel one side of the clear Miyagawa river filled with gold and ruby carp. 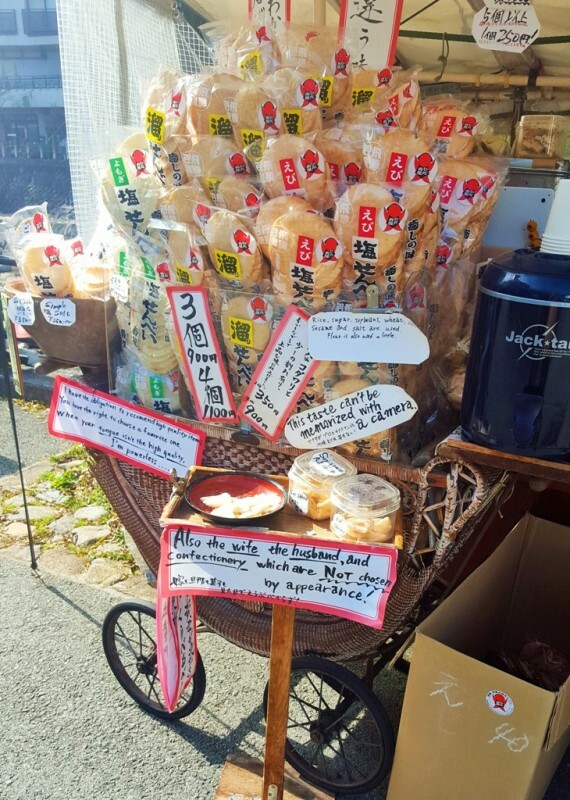 Here, locally made Sarubobo dolls, snacks and fresh produce are on sale while nearby cafes take advantage of the hungry crowds. It’s a fun place to people watch if nothing else, though I’m pretty sure the rice crackers we purchased went for half the cost at the convenience shop under our hotel! But hey, the convenience shop wasn’t nearly as cute, nor did it offer the quirky handwritten notes plastered all over the display stand, so I suppose it is true that what you’re really paying for is the experience. 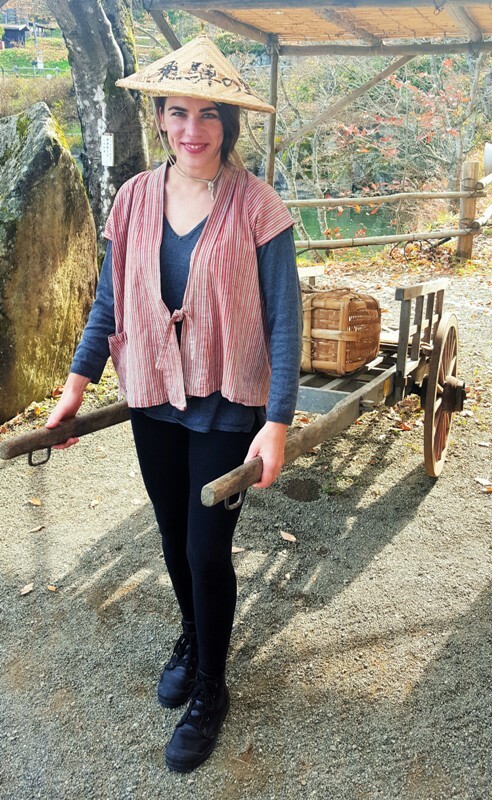 And speaking of experiences, this is where our Favorite Thing about Takayama comes into play: the Hida Folk Village, which is an open air museum, more or less, about a 30 minute walk (or ten minute bus ride) from the Takayama train station. This recreated village is actually a collection of over 30 heritage buildings dating between the 1600s and 1800s. 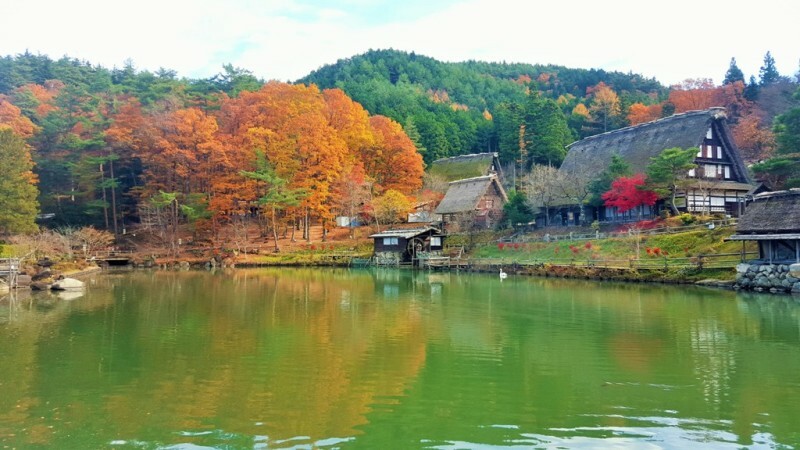 The houses and buildings were originally scattered around the Hida countryside — and many were quite isolated from fellow neighbors — but in 1971 they were plucked from their foundations and moved to Takayama as a cultural heritage site. The thatched, steeply gabled homes with interior displays illustrating traditional life from a few hundred years ago are interesting to check out (though wear shoes that are easy to slip off and on as most buildings require you to remove your shoes prior to entry) and the village layout featuring a glassy lake — complete with a white swan — does actually look like something from a picture book. There are crafts and activities for kids, as well as funny photo-op stands where you can pose like a [very authentic?] Hida villager … or not. 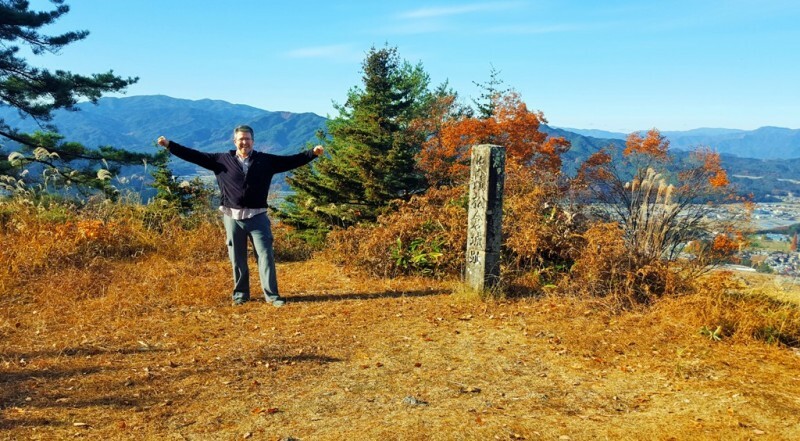 But what we loved the most about visiting the Hida Folk Village was the beautiful forest hike up Mt.Matsukura where castle “ruins” overlook the town of Takayama and beyond. 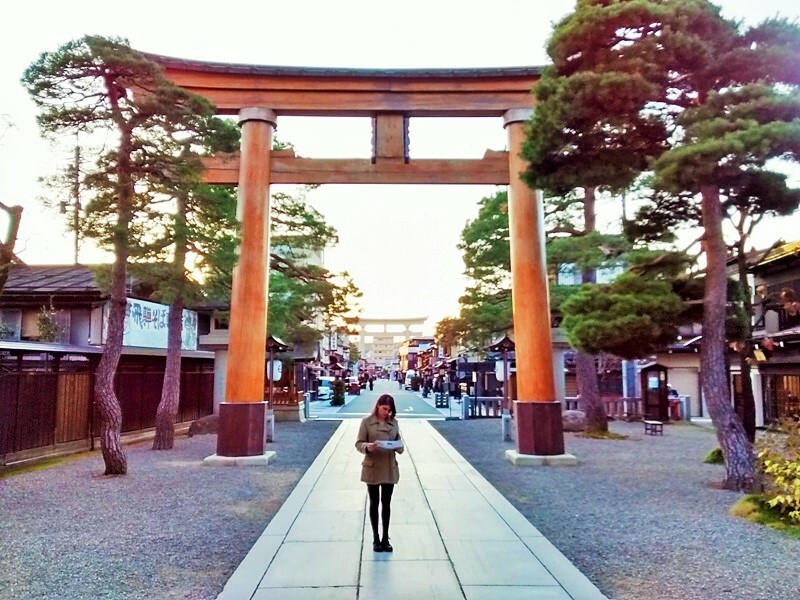 The hike, which takes about 30 to 40 minutes one way at a leisurely pace, was one of our Japan highlights, for sure. Perhaps because we just stumbled upon it with no expectations. Or maybe it was because during the entire hike, we were the only souls to be seen in the forest and on the mountaintop. Turns out, the castle ruins are really just the remains of a stone foundation, but the view is what you come here for. And the woods. And the serenity and dazzling colors. And the cred to say, “We climbed a mountain!” without having to do all that much, to be honest. But, hey. We climbed a mountain! 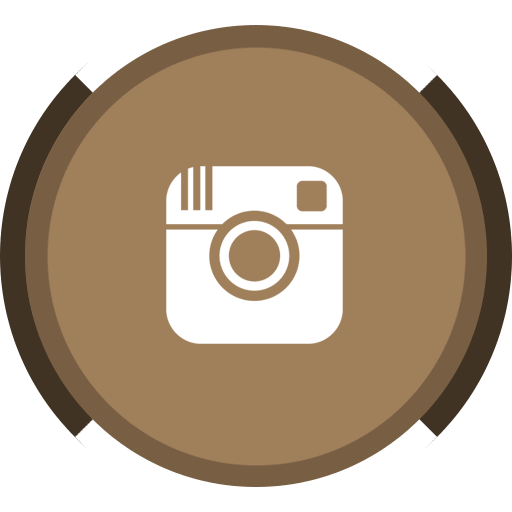 To find the path up the mountain, look for a dirt trail leading into the woods from behind the Woodcutter’s Hut. Yup. That may sound like really bad advice (“Hey stupid tourist, yeah! Just go behind that woodshed and then follow a lonely trail into the woods ….”) but it appears to be a legit hiking path, especially since a warning sign informs the intrepid hiker to be sure to return to the park before closing or else they won’t be let back in! 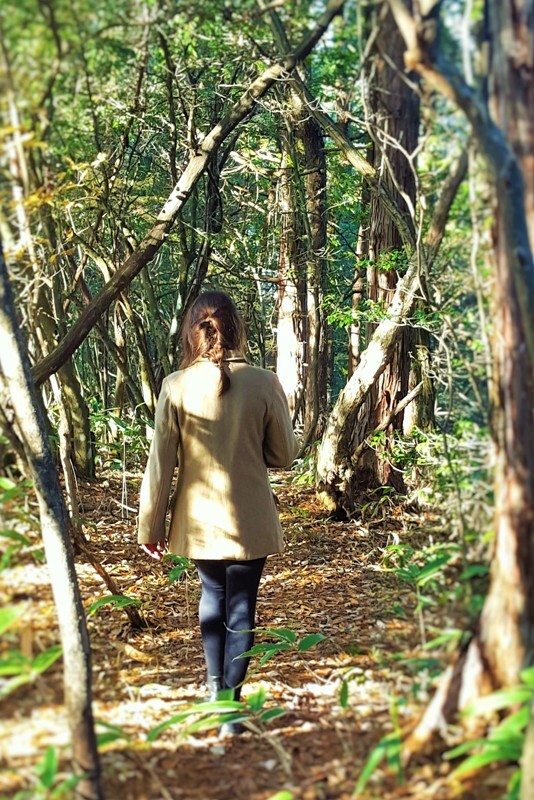 Legit or not, hiking up Mount Matsukura was our favorite experience in Takayama. The hike is unbelievably pristine and peaceful; we only wish we could have spent more time hiking (the path went on from the summit, down the other side of the mountain) but we didn’t want to find ourselves lost when the sun set … or get locked out of the Hida Folk Village! 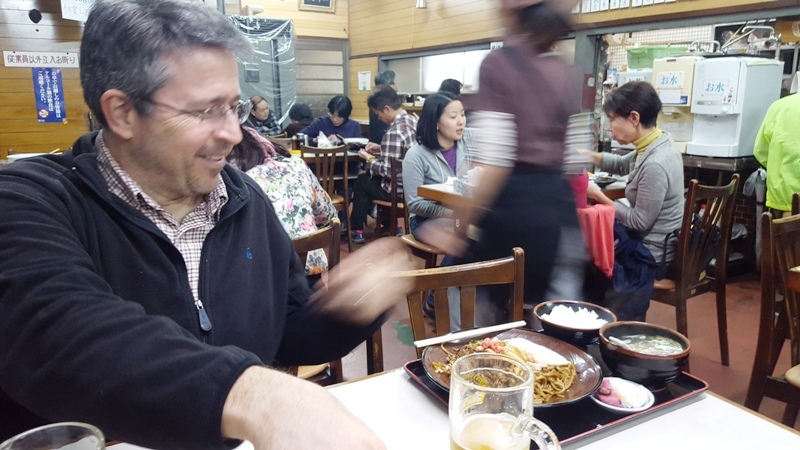 Takayama can be an expensive place to eat, especially since one of their local specialties is the uber-marbled, tender Hida Beef, where one can spend a fortune sampling paper-thin slices. I’m no connoisseur, but I wasn’t just swept away by the beef (I guess I like beef a little less fatty). Also, I guess I don’t really want my steak to melt in my mouth. I want to chew it, you know? But then again, maybe we just didn’t go to a great place. I found this post from a fellow traveler who recommends the Maruaki Restaurant in town..
We stayed at the Country Hotel, which is located right across from the train and bus stations. A 24-hour convenience shop is directly underneath, which can come in handy! Their website appears to be Japanese only, but you can book through other online agents. Their phone number is 057735-3900.